Ohio Gov. John Kasich visited Zumbrick Farms near Rossburg Monday to speak with kids in ag programs who recently learned they will not be able to exhibit poultry or fowl at the fair this year because of the danger of avian flu. A couple of turkey chicks and one full-grown bird were on hand to provide some context as the governor spoke to 4-Hers at Zumbrink Farms. Gov. 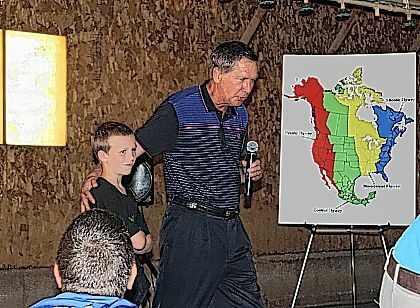 John Kasich spoke to local ag kids about the threat of avian flu and the reasons they wouldn’t be able to show poultry at the fair this year. After addressing the youth at Zumbrink Farms — during which he called himself the “president of Ohio” — Gov. John Kasich was surrounded by media asking about the possibility of a run for presidency of the United States. ROSSBURG — Encouraging young poultry producers not to “give up or get frustrated,” Gov. John Kasich visited a Darke County turkey farm Monday. The governor’s stop came on the heels of last week’s announcement from the Ohio Department of Agriculture (ODA) that it was banning all live bird exhibitions in an effort to prevent Highly Pathogenic Avian Influenza (HPAI), or “avian flu,” from infecting poultry in the state. This preventative measure applies to every county event, including the Darke County Fair, as well as the Ohio State Fair. Currently, there have been no reports of infection among Ohio birds. Neighboring state Indiana reported one instance of avian flu in May. States such as Iowa, Minnesota and Wisconsin, however, have suffered significant poultry losses. The gathering took place at Zumbrink Farms, a turkey facility near Rossburg. Among those assembled were youngsters from various local agriculture clubs who will not be exhibiting their poultry at fairs due to the ODA decree. Kasich was joined at Zumbrink Farms by ODA Director David T. Daniels. The director also addressed the young people directly, telling them, “While it’s unfortunate you that you don’t get this opportunity to show, it’s also a very great learning opportunity for you as well,” he said. Kasich also spoke directly to the young poultry exhibitors seated on hay bales, asking them questions about their poultry-raising experience and if they understood the reasons they would not be able to show their birds this summer. “The country can learn a lot from people who are in agriculture. The country can learn a lot from these kids,” he said. “When I was nine, I was disappointed because I could never make the baseball team, but I became governor, so I learned something,” he said, to laughter. After earlier characterizing himself as the “President of Ohio,” said in order to put his position in better perspective for the young attendees, Kasich was asked by reporters when he was planning to declare his presumed 2016 candidacy for the White House. “A while. It’s still away,” he said. “We have a disciplined effort. We try to figure out whether we can win. I’m not going to do this if we can’t win, but things have been extremely positive, and now a lot of people around the country, the pundits and all that, are beginning to recognize the potential. While the governor spoke to the press, the attending youth got the opportunity to try on the protective clothing worn by workers on local poultry farms to prevent the possible spread of disease.